When it downgraded the credit rating of the State Bank of India (SBI) earlier this week, Moody’s voiced concerns about the “modest capital and weakening asset quality" of the largest commercial bank in India. All banks need capital to back their loans, as insurance in case these loans turn bad. SBI’s Tier1 capital -- essentially shareholders funds -- is now below the global norm of a minimum 8% of risk-weighted assets. So the bank will have problems absorbing loan losses if the economy deteriorates. Getting Tier1 capital back above that basic minimum will require quick action from its majority owner -- the government. A day after the downgrade, government officials scrambled to reassure investors that the government would be pumping in between ₹ 3,000 crore to ₹ 10,000 crore in SBI. As the Mark to Market column in Mint this morning asks about the SBI downgrade: “Was the government sleeping?" It was. The government seems to have completely misjudged the capital requirements of the banks it owns, being very miserly about capital infusions even as it goaded banks to lend more. In the budget speech delivered by finance minister Pranab Mukherjee on 28 February, the government said it would provide ₹ 6,000 crore to help public sector banks to maintain their Tier1 capital at the minimum acceptable level. Notice: that is ₹ 6,000 crore for all public sector banks. SBI itself will require more than this number. The bank has been trying to sell a rights issue of around ₹ 23,000 crore; the actual capital it will require could be even more. Maintaining bank capital at a bare minimum is not a sensible strategy, given that bad loans will need to be written off in case asset quality declines because of a weakening economy. Private sector banks such as ICICI Bank have far higher levels of capital. Interestingly, the Reserve Bank of India has said in its recent guidelines for new private sector banks that they will have to maintain a capital adequacy ratio of 12%. The government does not have the resources to build up bank capital, because the fiscal deficit is already way ahead of the budgeted targets. This is likely to be a constraint in the years ahead as well. 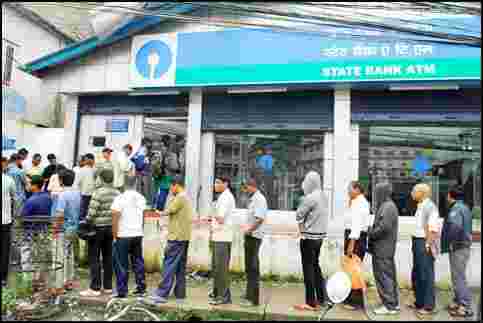 The best way out is to revive a proposal made by the government headed by Atal Bihari Vajpayee, to bring down the minimum government holding in public sector banks from 51% to 33%. The bill ran into political opposition and was given a burial. The public sector banks are paying the price.